San Francisco Sep 15 (IANS) A major global summit ended on Friday in this California city with delegates calling on national governments to join forces to step up climate action ahead of 2020 the year when global greenhouse gases need to peak and fall sharply thereafter to avoid the worst impacts of climate change. The meeting of leaders from states and regions cities business investors and civil society at the Global Climate Action Summit (GCAS) an initiative by California Governor Jerry Brown underlined the transformational action they are already pursuing. "There is now a shift in the focus. China and California are directly talking to each other and with California on its own being the fifth largest economy of the world is not a small deal " a US climate expert told IANS. Over 100 leaders for example are now committed to carbon neutrality or removing as much carbon dioxide from the atmosphere as they emit with the Governor of California bringing the date forward for his state achieving this to 2045. These are aimed at avoiding risks and seizing the opportunities outlined in a suite of reports including the new Unlocking the Inclusive Growth Story of the 21st Century by the New Climate Economy. Generate over 65 million new low-carbon jobs in 2030 equivalent to today s entire workforces of Britain and Egypt combined. 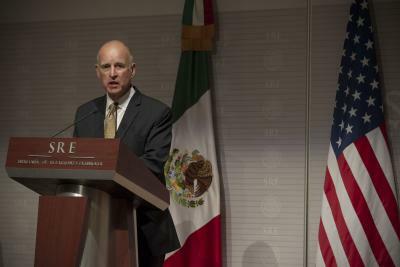 Governor Brown and a summit co-chair said: "Now it s time to take this momentum back home. Climate change waits for nobody. Let s get to work." In the healthy energy systems an alliance of more than 60 state/regional city governments and multinational businesses are now committed to a 100 per cent zero emission targets through the ZEV Challenge. Twelve regions including Catalonia Lombardy Scotland and Washington State representing over 80 million people and over five percent of global GDP will have 100 per cent zero emission public fleets by 2030.
Business is stepping-forward with 23 multinational companies in EV100 with revenue of over $470 billion committed to taking fleets zero emission. IKEA Group will transition to EV in Amsterdam Los Angeles New York Paris and Shanghai by 2020 - to reach 100 per cent zero emissions for last mile home delivery. More than 3.5 million additional zero emission vehicle charging points will be installed by 2025 and a goal for transport hydrogen to be zero-emissions by 2030 was launched. Almost 400 global companies along with healthcare providers cities states and regions now have 100 per cent renewable energy targets. A total of 488 companies from 38 countries have adopted emission reduction pathways in line with the science of the Paris Agreement up nearly 40 per cent from last year. Nearly a fifth of Fortune Global 500 companies have now committed to set science-based emissions reduction targets including big emitters like India s Dalmia Cement. At the climate action summit 21 companies announced the Step Up Declaration a new alliance dedicated to harnessing the power of emerging technologies and the fourth industrial revolution to help reduce greenhouse gas emissions across all economic sectors and ensure a climate turning point by 2020. Signatories include several established climate leaders: Akamai Technologies Arm Autodesk Bloomberg BT Cisco Systems Ericsson HP Hewlett Packard Enterprise Lyft Nokia Salesforce Supermicro Symantec Tech Mahindra Uber Vigilent VMware WeWork Workday and Zoox. For sustainable communities over 70 big cities home to some 425 million citizens are now committed to carbon neutrality by 2050. A further 9 100 cities representing 800 million citizens are now committed to city-wide climate action plans. Mayors of over 70 of the world s key cities reaffirmed their commitment to delivering on the highest ambitions of the Paris Agreement. Nine of the world s leading philanthropic foundations announced their intent to commit at least $459 million through 2022 to the protection restoration and expansion of forests and lands worldwide. The announcement underlined indigenous people and traditional communities collective land rights and resource management. The Investor Agenda was formally launched bringing together nearly 400 investors managing $32 trillion of assets including CalPERS the largest US pension fund; La Caisse de dÃ©pÃ´t et placement du QuÃ©bec (CPDQ) Danish pension fund PKA and Sumitomo Mitsui Trust Asset Management. It means that investors with assets more than a third larger than the economy of the US are now firmly focused on accelerating and scaling-up financial flows into climate action and building a more sustainable low-carbon global economy. A Global Green Bond Partnership backed by the World Bank International Finance Corporation Amundi and major climate finance and sustainability groups was launched with the aim of supporting and assisting sub-national and corporate green bond issuance. At the end of the final plenary Governor Brown announced that California would be developing its own climate change pollutant-monitoring satellite in partnership with San Francisco earth-imaging company Planet Labs. Patricia Espinosa Executive Secretary of UN Climate Change and summit co-chair said: "This summit and its Call to Action make an important contribution towards achieving our collective goal: to keep global temperatures to 1.5 degrees Celsius in line with the Paris Agreement." Mahindra & Mahindra India s leading manufacturer of utility vehicles and part of the $20.7 billion Mahindra Group announced its commitment to become a carbon neutral company by 2040.